Flagler County Emergency Services, the governmental agency responsible for the management of the large county EOC, has elected to change the way it coordinates with volunteer groups, including several emergency communications groups. ARES® will be incorporated under this new structure. Instead of having volunteer communicators and operators serve the EOC via liaison with leaders of the volunteer groups, emergency management will now seek to manage the volunteers directly by having each volunteer apply for and be trained for specific duties under the direct supervision of EM officials. From the EM Web site: "Without trained and organized volunteers government cannot properly respond to or recover from the impacts of large disasters. Flagler County Emergency Management is accepting applications for volunteers under the Division's new volunteer program. The Flagler Emergency Management Volunteer (FEMV) organization will be open to all residents of Flagler County. All volunteers in this organization will be trained, issued uniform shirts and an identification badge. FEMV members will be under the direction of Flagler County Emergency Management . . . for preparedness, response, recovery and mitigation efforts. Volunteers who have previously provided services to Flagler County, whether direct or through a volunteer agency, are requested to complete an application immediately. Recruitment and training dates will be posted . . ."
Our job as ARES® operators in the county is to continue to support the EOC to the best of our abilities and training, under the new management approach. There is, of course, the continuing role of our EC Robbie Creal, KG4HUF, to provide internal leadership, recruitment and training for our ARES® organization. Early indications are that the massive communications support effort for this past weekend's major MS-150 event here in northeastern Florida was a huge success, according to EC KG4HUF. More on the effort in next month's issue. Congratulations to Douglas County (Oregon) EC Jerry Eifert, AE7ER, of Roseburg, who has won the Oregon Volunteer of the Year Award. A fine newspaper article tells the story here. For two years in a row, Alabama has finished fourth in the country out of 52 participating sections in the annual ARRL Simulated Emergency Test (SET). Jefferson County alone scored 555 points in 2009, placing the county in fourth place in the country out of 330 county/local level participating groups. Jefferson County's score alone was higher than the scores of 27 states/sections. However, despite Calhoun and Jefferson counties both scoring over 500 points in 2009, Alabama's total fell by over 900 points. This appears to be due to fewer groups participating (14 in 2008, 12 in 2009) and lower scores (11 groups scored 168 or higher in 2008, only five scored 168 or higher in 2009). So Jefferson County EC Hub Harvey, N4HUB is asking his operators "what are you doing to be ready, resilient and responsive"? His organization plans to participate with Shelby County as a partner this year in a "Metropolitan SET." They will activate several served agency stations and are asking nine Jefferson County hospitals with Amateur Radio equipment to participate. This month, ARRL and the Amateur Radio community celebrate the 75th anniversary of ARES®. To help commemorate this milestone, ARRL has introduced an anniversary Challenge Coin. The die-struck, one and one half inch brass coin depicts, on one side, the ARES® 75th anniversary logo in gold with red, white and blue color fill. The other side of the coin includes the ARRL diamond logo against a hemisphere of the world. "Around the perimeter of the ARES® logo are the words READY, RESILIENT and RESPONSIVE," said Emergency Preparedness and Response Manager Mike Corey, W5MPC. "These words represent the critical need that ARES® activities have provided, and will continue to provide into the future. The Challenge Coin honors the service of ARES® volunteers and all Amateur Radio operators that respond to the call of public service. We hope ARES® volunteers will enjoy the honor of having the first Challenge Coin issued by ARRL", said Corey. 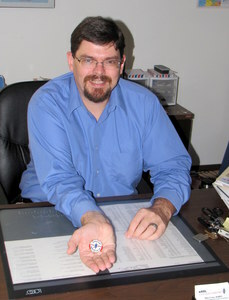 ARRL Emergency Preparedness and Response Manager Mike Corey, W5MPC, shows off his new ARES Challenge Coin. While there are many stories about the origin and history of challenge coins, these medals have been popular with organizations and leagues for decades. Marketing Manager Bob Inderbitzen, NQ1R added, "Challenge Coins are probably most common among the military and civil service organizations. These mementos are often used to commemorate a special occasion or to show loyalty among individuals that share pride and affinity for a particular service or agency. The coins are even popular among police, fire and EMS officials." The coin is struck with the year-of-issue, which in this case is 2010. Five diamond shapes on the coin's head signify the five ARRL pillars: public service, advocacy, education, technology and membership. "We hope this is the first of a series of Challenge Coins for ARRL," said Inderbitzen. The ARES® 75th Anniversary Challenge Coin, as well as commemorative t-shirts and mugs, are available directly from ARRL http://www.arrl.org/shop/Emergency-Communications/. A Herculean effort by a panel of leading Florida radio amateurs has resulted in a new emcomm plan for the large and disaster-prone ARRL Northern Florida section. The new plan was announced by Section Manager Paul Eakin, KJ4G, reflecting changes in emergency management and radio communications over the course of the past few years. The major change is that the new plan is centered on NIMS ICS protocols. It refers to a section-wide ARES® data base that meets the requirements of the section's major served agency: the Florida State EOC at Tallahassee. The data base includes records of NIMS, ICS and ARRL course certifications, FCC addresses, resource typing for filling deployment assignments, contact information for next of kin, and limited medical data. (More on the data base below). As an example of standardization, plan co-author David Miner, W4SKG, the Assistant DEC of the Capital District, reworked the Incident Command System message form ICS 213 to incorporate the ARRL Radiogram format. "The Northern Florida Section is adapting this form as our official message form," said Eakin. "The Florida State EOC has stated that all traffic coming into and going out of the facility will be required to have a contact person, authority notation and phone number to be accepted as valid." "This is for tracking purposes; our new integrated form has provisions for phone numbers and authority positions," Eakin said. The new Northern Florida ARES® Emergency Communications Plan (download at bottom of page) serves the local Emergency Manager and the local community Amateur Radio operator to promote relationships that will best serve the emergency communication needs of their communities under the ARES® banner. The plan has two purposes: The first is to provide professional Emergency Managers with an understanding of who, what, and how Amateur Radio volunteers can assist in the emergency communications function. The second is to provide a systematic method for Amateur Radio operators to voluntarily deliver supplemental radio communication services when requested by local, state and national-level Emergency Managers. The plan provides Amateur Radio operators with a consistent, effective and scalable communications response framework under the ARES® program. The plan recognizes that the National Incident Management System (NIMS) is the national standard that promotes interoperability among the various disciplines and agencies. ARES® members are expected to have an Incident Command and management organization that emergency managers and responders in the field can easily recognize and work with. In emergency situations, the ARES® organization serves that purpose by having various section officers and appointees assume emergency response duties. Each local ARES® (city or county) should consider adopting an emergency organization structure that conforms to the NIMS standard also. The plan delineates different levels of response: Local (city or county) level; State level; and National level. To facilitate responses, the Northern Florida section maintains the Northern Florida ARES® Data Base (NFLDB) of Amateur Radio operators who have registered to serve at the state level in times of communication emergencies. The data base contains a formal record of each volunteer's demonstrated radio communication performance capabilities, education courses successfully completed, and stated personal deployment requirements so that assignment of individual operators to emergency deployment missions can be made. When state level requests for services are received by the Section, this data base will be the only repository from which deployment selections will be made. As for levels of activation, "No Alert" is the normal situation for Amateur Radio communications: No state of alert or emergency exists. When a situation arises, affected ECs and DECs may declare any of three levels of alert of their organization. Level III is the "monitoring phase" and alerts operators in a specified area or functional unit (such as a net) that their services may be needed on short notice in the next 24-48 hours. Level II is a "partial activation" and constitutes an operational status. Level I is the highest possible level of alert in an emergency communications operation. It is useful for controlling HF circuits when heavy traffic and large numbers of stations may increase channel load on nets. When distress traffic is being handled on any emergency net or frequency, the activated level is automatically Level I and remains so until all distress traffic has been cleared. "Full Scale Activation" can be declared at the Section level only by the SM, by issuance of a Priority bulletin to be transmitted on all active net frequencies. It applies solely to nets and geographic areas designated in the formal order. The "Stand Down Phase" authorizes DECs and ECs to begin the stand-down process of the activation. Stand Down is permissive only; it does not require that operations be shut down in the specified area. It simply advises the designated DECs and/or ECs that no apparent reasons exist for continuing operation unless they have local requirements. Any portion of the Section Plan can be activated in support of any incident in the State of Florida and/or whenever the FEOC is activated, and specifically when mid-state relay is necessary to support operators in other ARRL sections requiring relay to/from the FEOC. The plan calls for use of both the NTS standard ARRL message format and the ICS-213, as they are similar in purpose, but remain different in structure. Emergency Management and EOC personnel are going to be using the ICS-213 format, but messages received from other sources will likely be in the standard ARRL format, unfamiliar to Emergency Management officials. The ARES® operator should place the ARRL-formatted message into the body section of the ICS-213 before delivering it. Thus the ARRL message remains intact, and the Emergency Management official has a document he understands. Using these procedures will enable the uninterrupted flow of message traffic, and the messages will be in a format familiar to the users and recipients. The Florida State EOC accepts any and all messages from any source. However, its staff prefers an Amateur Radio liaison of only one licensee, regardless of where in the state an incident might occur. For practical purposes, the contact person is the Northern Florida Section Manager or his/her designate. Amateur Radio operators will be deployed to the FEOC only upon the EOC's request, and these amateurs will be trained by the FEOC, the STM and the Capital DEC. Given the size of Florida and the fact there are three ARRL Sections within the state, there are times when an incident might occur and not impact the Northern Florida Section. In such cases, the Florida EOC will need to establish amateur communications with the Section where the incident is located, and the Northern Florida Section will need to mobilize to support such communications. When HF conditions are poor, stations in the central part of the state (along the I-4 corridor) will be used as "Mid-State Relay" stations. They will stand by on a selected HF frequency to assist in communications when the Florida EOC needs direct contact with a station too weak to copy in adverse conditions. The "GATEway Stations" are a group of operators who are in constant VHF/UHF contact with the Florida EOC, regardless of where in the state an incident might be. The FEOC prefers all traffic to come through the gateway system, properly formatted and identified. These operators are an elite group. They are WINLINK-qualified, hold FEMA certifications and are all appointed as ARRL Official Relay Stations (ORS). Their function during any activation is to serve as a liaison point to the FEOC, using whatever mode(s) is mandated by the FEOC for that incident. The "GATEway Network" is comprised of selected HF voice stations that also have access to local VHF/UHF voice networks. When alerted, typically, each District will have a GATEway Station available on the HF North Florida Emergency Net (NFEN) and on the District VHF voice network. A GATEway cannot function without VHF links to the County EOC and other local points designated by the EC or DEC. ECs are strongly encouraged to use the County and District VHF nets and avoid using HF at all, if possible, for local communications. This reduces congestion and confusion on the HF Emergency Net and expedites all traffic. ARES® operators are subject to a criminal background check. To qualify for official deployment requires the operator to provide a Florida Driver's License ID number when registering in the Northern Florida Section Database. Deployment for emergencies directed by the Northern Florida Section will not be authorized unless the operator has voluntarily submitted the necessary information to be officially listed in the Northern Florida Data Base. o Advanced Emergency Communications (Combined L2 and L3 ). Requires SM recommendation and approval. For DECs and above. The goal of the Neighborhood HamWatch program is to provide a way for every capable Amateur Radio operator who isn't involved in a deployed active ARES® operation to serve his/her community in an emergency communication role. HamWatch amateurs are good communicators, and have ample stations with emergency power they can use during periods of extended communication outages that often follow major disasters. These amateurs augment the active ARES® volunteers and are active participants of the emergency communications system at the neighborhood level. Program objectives include: 1) Communicate neighborhood conditions to local EOCs. Emergency Managers will be provided access to first-hand information. They will handle heath and welfare messages, report crime and fulfill other communications needs. 2) Relay information from local Emergency Managers back to their neighbors so they are better informed of relief efforts. Participation in the program requires operators to have the desire and capability to use their licenses to help their neighbors. There is no special training or equipment burden necessary. A valid license and a 2-meter/UHF radio and/or HF rig will do the job. Neighborhood HamWatch operators also communicate with ARES® stations that are in direct contact with local government EOCs. Because of commercial outages, this may be the only link to the outside world for a neighborhood. Operators describe neighborhood conditions, medical needs, and dangerous situations to Emergency Managers and staff. Emergency Managers can relay messages back to neighborhoods. How to get started? An informational brochure is available here, which will help explain the program and can be printed by local hams and distributed to their neighbors. This will acquaint neighbors with their next-door Amateur Radio operators and establish the Neighborhood HamWatch groups. ARES® ECs, and NCS's can help by including a check-in option for Neighborhood HamWatch operators during or immediately following training nets so participating hams can begin establishing contact familiarity. · I store 10 gallons of drinking water before the storm (some people store up to 50 gallons for a family of four). · I freeze as much water as I can in plastic bottles and tubs. It helps preserve my food and provides cool water to drink as it melts. · Filtering: 4-5 layers of cheese cloth removes almost anything non-microbial. Coffee filters do well also. · Sewage and hydrocarbons: My home sits on the highest point for a mile or more; storm water has never risen past the curb of the street, even during TS Allison, which flooded 80% of the city. There is very little chance of contaminated water entering my swimming pool. · My plan is to drink the stored water first and use pool water only if the outage lasts beyond 3-4 days. · I have a propane grill with 2 large bottles of gas, plus a natural gas line I can hook up (I can convert the grill easily). Congratulations to the framers of the major, new rewrite of the Northern Florida Emergency Communications Plan. It not only provides an excellent platform for section activations, but also serves as a fine template and model for local, county, and other section efforts. I'd like to hear from other groups around the country who have had their local or county EOCs change to direct management of volunteers, like Flagler County recently did, discussed above in "The View from Flagler County." What were the impacts on your local ARES® programs, the good, the bad and the ugly? Join or Renew Today! ARRL membership includes QST, Amateur Radio's most popular and informative journal, delivered to your mailbox each month. Subscribe to NCJ - the National Contest Journal. Published bimonthly, features articles by top contesters, letters, hints, statistics, scores, NA Sprint and QSO Parties. Subscribe to QEX - A Forum for Communications Experimenters. Published bimonthly, features technical articles, construction projects, columns and other items of interest to radio amateurs and communications professionals. Free of charge to ARRL members: Subscribe to The ARRL Letter (weekly e-letter filled with news and features), the ARRL Contest Update (bi-weekly contest newsletter), Division and Section news -- and much more! ARRL offers a wide array of products to enhance your enjoyment of Amateur Radio. Visit the site often for new publications, specials and sales. Donate to the fund of your choice -- support programs not funded by member dues! Click here to advertise in this newsletter. The ARES E-Letter is published on the third Wednesday of each month. ARRL members may subscribe at no cost or unsubscribe by editing their Member Data Page as described at http://www.arrl.org/ares-e-letter. Copyright © 2010 American Radio Relay League, Incorporated. Use and distribution of this publication, or any portion thereof, is permitted for non-commercial or educational purposes, with attribution. All other purposes require written permission.